Thanksgiving is without a doubt the most American holiday in our history. It is a celebration of beloved foods and traditions bringing to mind happy memories of good times shared with family and friends. Because this national harvest celebration is so near and dear to the hearts of Americans it is no wonder so many of us spend weeks planning this very special banquet. I look forward every year to the roster of ingredients so ritualized in our Thanksgiving meals. The anticipation of the usual heirloom dishes of cornbread stuffing, butternut squash and mashed potatoes always induce many enduring holiday memories of years past. However, even though our families expect many of same dishes prepared from year to year, I always like to add something new and different to the holiday feast. It’s also a bonus when this new dish is particularly attractive and noticed almost immediately by your guests. 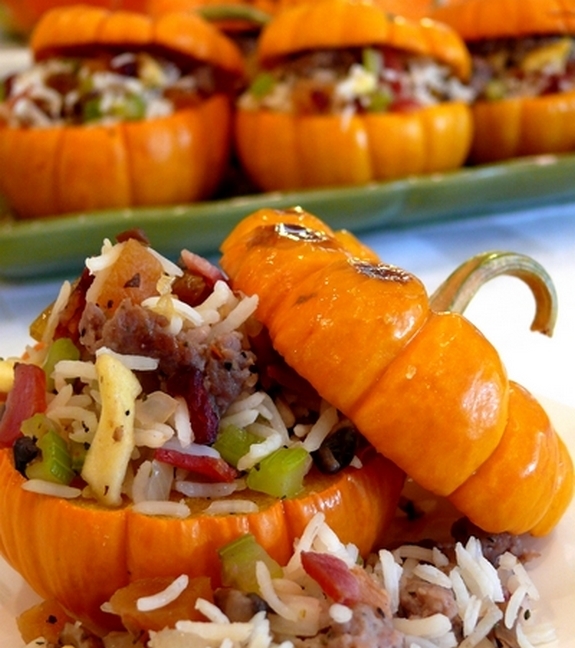 This year, bring the beauty of Fall indoors and serve these Mini-Stuffed Pumpkins with a Sausage-Rice-Fruit Medley. This dish will elevate your holiday table with its rustic charm, natural beauty and comforting flavors. 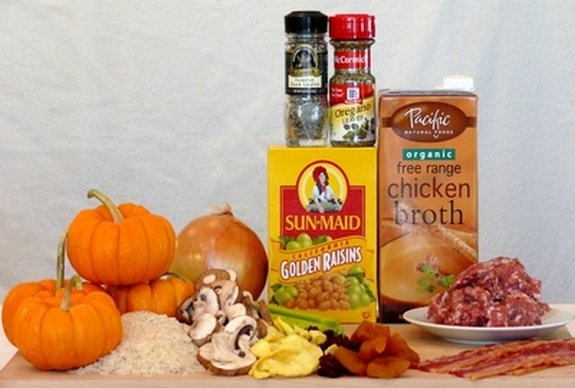 Here is what you will need to make this dish: Basmati rice, chicken broth, Portobello mushrooms, celery, brown onion, dried apricots, dried cranberries, dried apples, golden raisins, bulk breakfast sausage, bacon, crushed sage leaves, crushed leaf oregano and mini-pumpkins. Additional ingredients not shown are olive oil, salt, pepper, fresh oregano and fresh sage for garnish. 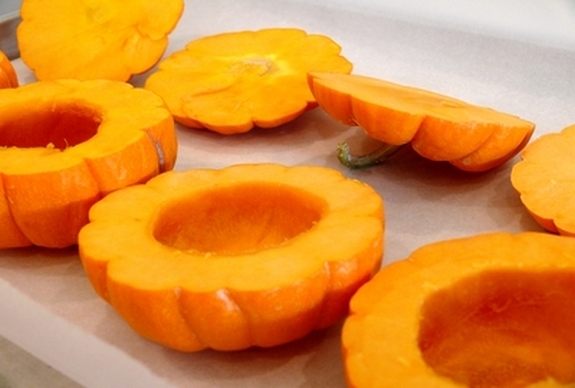 With a sharp knife, slice off the tops of the pumpkins, right under the stems. Scoop out the seeds and scrape the inside edges with a spoon, until a smooth surface is achieved. Place the pumpkins and their tops on a baking tray. The flesh ends of the top of the pumpkins should be facing upwards on the tray. Brush the inside and the tops of the pumpkins with olive oil and sprinkle with salt and freshly cracked pepper. Roast in a 350 degree oven for 30 minutes or until fork tender. Add 3 cups of basmati rice and 4 cups of chicken broth to a large pan. Cover and bring to a boil, turning heat to low until all the broth has evaporated, about fifteen to twenty minutes. Remove pan from heat and set aside. While the rice is cooking, prepare 1 ½ cups chopped brown onion, 1 cup minced celery and 8 ounces of Portobello mushrooms, chopped. Set aside. In a medium skillet, sauté 8 slices of chopped bacon just until browned. Add one pound of bulk breakfast sausage to the same pan, cooking until both bacon and sausage are cooked through. Remove the bacon and the sausage from the skillet, leaving behind 2 tablespoons of the grease. Set the bacon-sausage mixture aside, keeping warm. Add onion and celery to the skillet; after 5 minutes, add mushrooms. Sauté until all vegetables are tender. Add ½ cup chopped dried cranberries, ½ cup chopped dried apricots, ½ cup chopped dried apples, ½ cup golden raisins, 1 teaspoon crushed sage leaves and 1 teaspoon crushed leaf oregano to the celery-mushroom mixture. Continue to sauté until the fruit is softened, about 5 minutes. In a large bowl combine cooked rice, sausage-bacon mixture and celery-fruit mixture. If the mixed rice appears dry, add chicken broth in ¼ cup increments. Mix well. Use the rice mixture to fill roasted pumpkins. 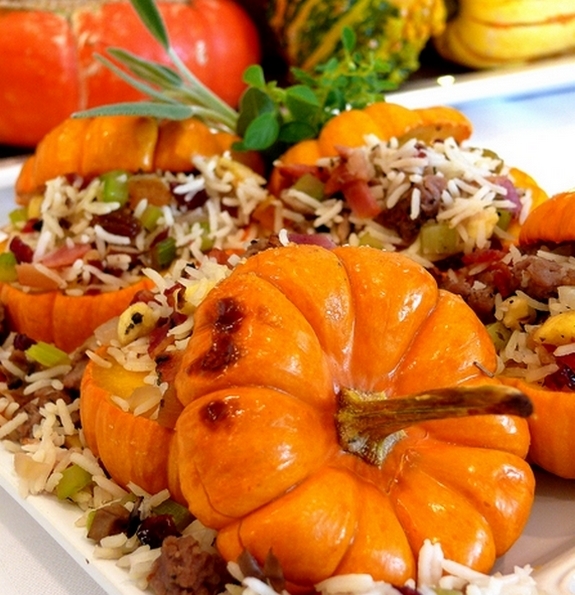 Place stuffed pumpkins on a large platter and serve warm. Place the pumpkins and their tops on a baking tray. The flesh ends of the tops of the pumpkins should be facing upwards on the tray. Brush the insides and the tops of the pumpkins with olive oil and sprinkle with salt and freshly cracked pepper. Roast in a 350 degree oven for 30 minutes or until fork tender. Add rice and chicken broth to a large pan. Cover and bring to a boil, turning heat to low until all broth has evaporated, about fifteen to twenty minutes. Remove pan from heat and set aside. While the rice is cooking, chop onion, celery and Portobello mushrooms. Set aside. In a medium skillet, sauté bacon just until browned. Add bulk breakfast sausage to the same pan, cooking until both bacon and sausage are cooked through. Remove the bacon and the sausage from the skillet, leaving 2 tablespoons of the grease behind. Set the bacon-sausage mixture aside, keeping warm. Add cranberries, apricots, apples, golden raisins, crushed sage leaves and crushed leaf oregano to the celery-mushroom mixture. Continue to sauté until the fruit is softened, about 5 minutes. Too beautiful to eat….almost. Just a side salad and supper is sorted!!! If nothing else they are absolutely gorgeous and as nina noted, (almost) too beautiful to eat … but the stuffing combination wouldn’t prevent me from diving right in! These are too adorable! You have been rocking out the recipes, good job! Wish I had this recipe back in October, would have been perfect for a Halloween dinner party we had. A little twist on the usual Jack-o-lantern. Yummy Cathy!!!! Happy Thanksgiving to your family!